This classic North Indian dish is one of my personal favorites. These days, most of the recipes you see or saag you order at restaurant calls for a lot of half&half, buttermilk, and tons of other heavy ingredients. This recipe simply uses full-fat yogurt and leaves you with a lighter, more rustic vegetable dish that still fills you up and leaves you quite satisfied! I find it too messy to and time-consuming to make the paneer myself, so I opt to just buy it premade. You can find it and garam masala at Indian and gourmet grocery stores like New Seasons (Portland), Whole Foods, etc. Bring a large pot of water to boil. Cook until heated or defrosted depending, then drain thoroughly. Set aside in colander to completely drain. 4. In a food processor/blender, mix garlic, onions, chiles, ginger, and 1/4 cup of water to make a paste. Set aside. 5. In a large pot ( I used our wok) over medium heat, add oil, cardamom, cloves, bay leaves, and cinnamon. Cook until spices darken, about 2 minutes. Add onion paste. Cook, stirring occasionally, until mixture thickens and darkens, about 15 minutes. 6. Stir in coriander, cumin, and turmeric. Cook until fragrant, about 2 minutes. Add tomato and 1/2 of yogurt. Cook until thickened slightly, about 3 minutes. Stir in spinach and salt, and then add remaining yogurt. Turn heat to low/simmer and cover. Cook, stirring occasionally, until flavors are blended, about 30 minutes to an hour. 7. Cut paneer into small cubes and gently stir into spinach mixture. Cook until paneer is heated through, about 2 minutes. Add garam masala. Serve hot, with naan or rice. Add black pepper, salt, more pepper, or even lemon to taste! 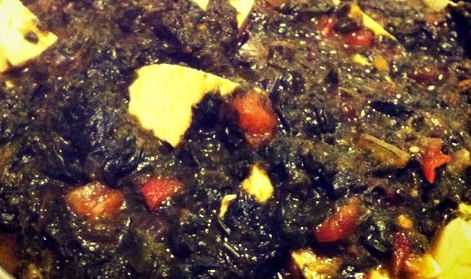 I must try this - I love saag paneer but sometimes it's too fatty or doesn't have enought cheese. Yum!